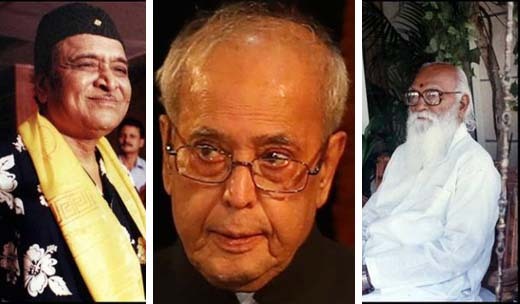 New Delhi, Jan 25, 2019: President Ram Nath Kovind on Friday conferred the Bharat Ratna, the highest civilian award in India, on former president Pranab Mukherjee. The award was also conferred on Bharatiya Jana Sangh leader Nanaji Deshmukh and legendary singer-composer Bhupen Hazarika posthumously. Born on 11 December 1935, Mukherjee served as president between 2012 and 2017. He has been a senior leader in the Congress and held several ministerial portfolios. He was also the finance minister from 2009-2012 under the prime ministership of Manmohan Singh. Having got his break in politics in 1969, Mukherjee had worked closely with former PM Indira Gandhi, becoming one of her trusted lieutenants. Deshmukh was a Sangh Parivar veteran, founder member of the Janata Party and one of the seniormost members of the Bharatiya Janata Party. A social activist, Nanaji played an important role in carrying out social restructuring programme in over 500 villages of Uttar Pradesh and Madhya Pradesh. He passed away on February 27, 2010 in Chitrakoot, at the age of 93. Hazarika (1926-2011) was a singer and filmmaker, popularly known as Sudhakantha. He was born in Sadiya, Assam. Known for his flawless baritone and his trademark Nepali cap, he was respected nationwide, as a great balladeer and also came to be known as the ’Bard of the Brahmaputra’. A poet and a lyricist, Hazarika also penned songs, which although written and sung in Assamese, have been known to have a universal appeal, stepped in themes of humanity and communal harmony. One of the foremost balladeer in the country who composed his own lyrics and music, Hazarika lent his voice to the film "Gandhi To Hitler", where he sang Mahatma Gandhi’s favourite bhajan ‘Vaishnav jan’. For his mammoth body of work and contribution to Indian cinema, he received the National Film Award for Best Music Direction (1975), Padmashri (1997), Padmabhushan (2001), and posthumously, the Padma Vibhushan (2012), among other awards.